“A captured German Machine Gun at the exhibition grounds at Toronto” [ Captured German artillery, c1919]. CCGW/CCGG 2016.1.111 Gift of E.McCann. We received this photograph recently and immediately loved it. It’s not immediately apparent from the image, but this artillery gun is very large! 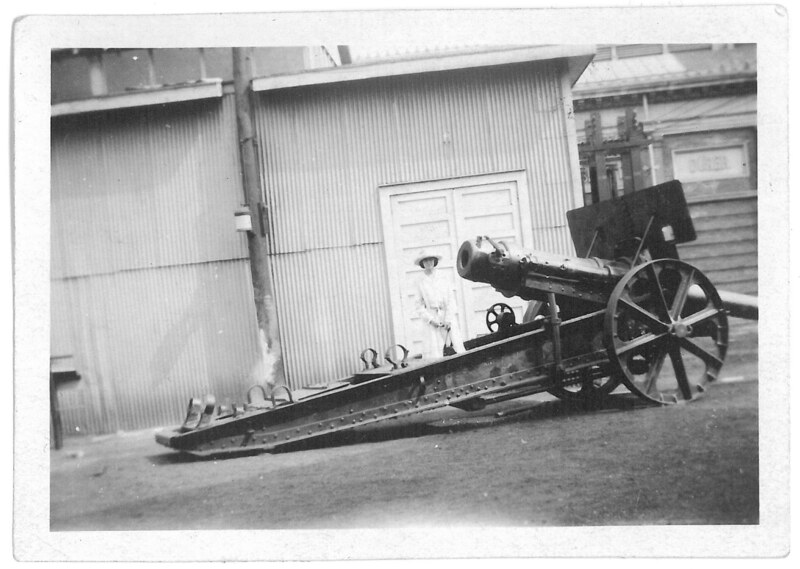 The woman pictured is actually standing in between the two arms of the gun carriage, which gives an idea of the size of the artillery pieces used in the Great War. The inscription on the back of the photograph reads “A captured German Machine Gun in the exhibition grounds at Toronto”. The inscription is significant for two reasons; firstly, the writer did not know the difference between a machine gun and an artillery gun, which points to how little information Canadians at home really had about how the war was fought in Europe. Until the appearance of Official War photographers in 1916, most press photos were taken from far behind the lines, and even official photos presented a highly controlled view of the war. Secondly, the gun in the photograph is one of the several thousand “war trophies” brought back to Canada by the CEF at the end of the war. These trophies, machine guns, artillery pieces, and other captured objects, were displayed across the country in 1919 as part of an official tour organized by the Union MP Newton Rowell, a former Liberal who had broken with the party over Conscription in 1917. After stops in the prairies, the trophies were shown at the Canadian National Exhibition, where this photo was taken. The trophies that were collected officially could be requested by towns in Canada, and many were installed in public spaces as commemorative reminders of the war. One hundred years later, some have been vandalised, or stolen, and they are often incongruous to their surroundings. The scrap drives of the Second World War also took their toll; artillery pieces like these contained far too much precious steel to be left alone, and hundreds were melted down to produce weaponry for those fighting the next war. We don’t know what happened to the gun in our photo, but whatever its fate, it travelled a long way. The gun is a 15 cm Feldkanone L/40 (or L/45) in Räderlafette, a naval gun adapted for field use. It may be No 432, which was captured by the 19th (Central Ontario) Battalion CEF, and was alloted to the Toronto Exhibition. There were five other 150mm guns (types not known) which were alloted to Toronto as trophies, but only one was specifically linked to the Exhibition. Two of these guns survive today in Woodbridge ON. Thanks Gord! You always come up with the missing information we need.